I beg to differ. I doubt that Johan ever went to the Bwabwata National Park. But I can promise you: wherever he might be now, especially if it’s in heaven, he will have found many things from Bwabwata up there. People often ask what our favourite birding spot is. I would rate the Bwabwata National Park situated along the Kwando River in the Zambezi Region among the top birding spots in Namibia, probably in the same league as Mahango and Impalila Island. After each birding trip we do our usual ‘saw’ list, and after Bwabwata we soon realised that, as far as birding is concerned, the park is a quantity and quality birding area par excellence. After 40 odd years as a bird-watcher and still seeing new bird species in a place I’ve visited regularly, is truly exceptional. On one of our visits I found a very expensive torch under a tree in the Nambwa Tented Lodge Campsite. It was in perfect condition. At first I found this rather puzzling, a torch being an expensive tool, but I soon realised how it had ended up there. That night a few restless elephants visited our campsite, and I could just imagine someone dropping it after suddenly being joined by a herd of elephants. Before my first visit to this park, I had often wondered whether Nightjars existed only in bird books. On arriving at the Nambwa campsite, I saw a Nightjar flying up virtually five metres from where we’d pitched our tent. (I’ll not go into details on which Nightjar it was.) The magic of Nightjars and owls has not ceased ever since. Nocturnal birds often heard and seen in the camp are the African Barred Owlet, African Wood-Owl and Verreaux’s Eagle-Owl. One of my wife Helga’s passions in life is the flora of our country, and Bwabwata is, to say the least, a hotspot in that area too (take two Mr Bach). During a drive through the woodland area, we happened on a group of Rhigozum brevispinosum in full bloom. It was a sight to remember. While Helga was being carried away by the spectacle, I saw some activity in a Markhamia zanzibarica tree nearby. On closer inspection I, in turn, became carried away by an assortment of sunbirds enjoying the sweet nectar of its flowers. A few films later, in the company of Amethyst, White-bellied, Scarlet-chested and Marico Sunbirds, I unexpectedly heard a rustle a few metres away. Luckily the elephants didn’t carry us away. Each and every trip to the park invariably produces its own specials as far as birding is concerned. Our last visit was no exception. The Dwarf Bittern is, as far as I know, extremely rare. Well, the good news is that I actually did see a Dwarf Bittern, and I even had the opportunity to take pictures to prove it. The Nambwa campsite is as good a bird-watching hotspot as you could ever wish for, so when planning a trip to Bwabwata, keep at least one day open for bird-watching in the camp. Apart from the usual birding parties lead by Arrow-marked and Hartlaub’s Babblers, followed by Swamp Boubous, Kurrichane Thrushes and Golden Weavers passing through every so often, be on the lookout for the Chinspot Batis, Orange-breasted Bush-Shrike and Black-headed Oriole, among other specials. Brown Firefinches and Spectacled Weavers love to drink at the river’s waterfront. 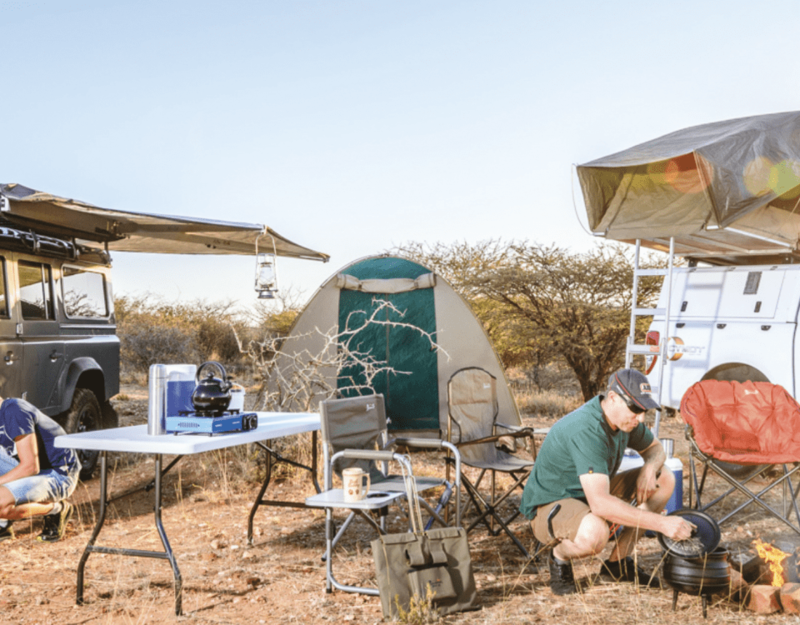 The call of the African Fish-Eagle, the regular fly-past of the African Marsh-Harrier in front of the campsite along the Kwando River, and the Bateleur patrolling the skies are part and parcel of everyday life in this beautiful park. On several occasions we’ve seen a pair of African Harrier-Hawks at Horseshoe Bend in the big leadwood, Combretum imberbe, tree. So, if you’re a raptor fundi, pack your bags, because the Dark Chanting Goshawk and many others are waiting for you to tick them off your list. The stork fraternity is well represented during the summer months. 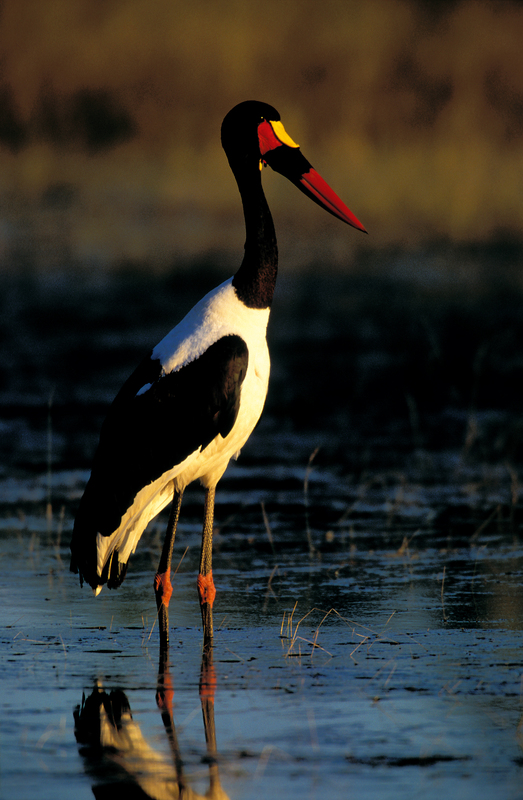 The Saddle-billed, Yellow-billed and African Open-bill are usually found near the water, while the Abdim’s, Woolly-necked and White Storks further afield are probably more interested in insects than fish. 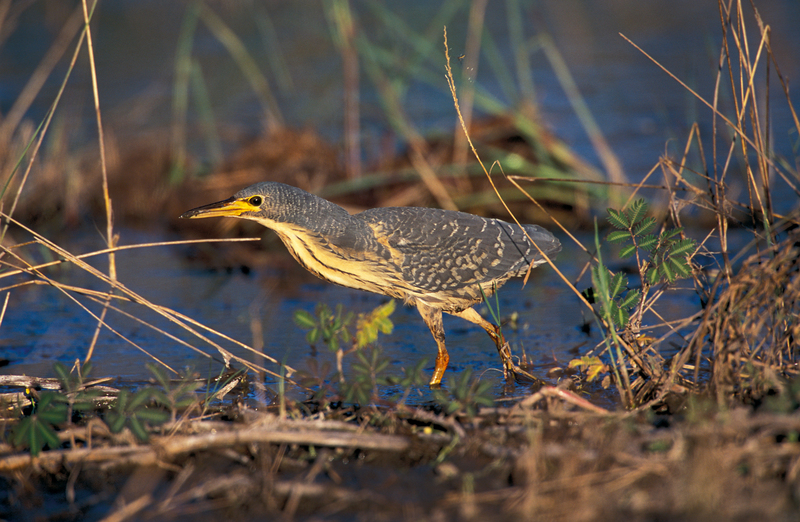 Along the riverbanks the Green-backed, Rufous-bellied Heron and Slaty Egret are often seen, while the Purple Heron is also a regular. After a good rainy season, the little pans along the road fill up and Comb, White-faced and Egyptian Geese start arriving. Incidentally, it was at one of these pans that we saw our Dwarf Bittern. These are also favourite hunting grounds for the African Wattled Lapwing, Hamerkop and Pied Kingfisher. To the south, along the omaramba, you’ll find plenty of Senegal Coucals and Red-billed and Southern Yellow-billed Hornbills. 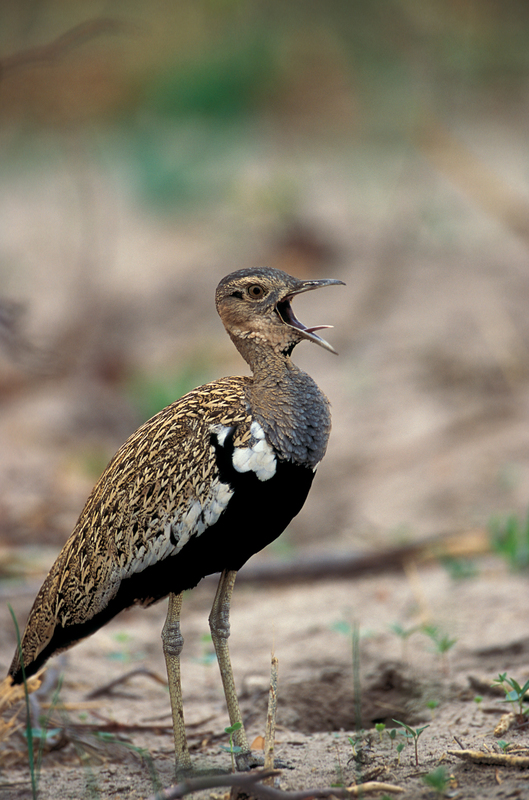 In the open grass veld the Black-bellied Bustard and Temminck’s Courser can often be seen. During the summer months the migrant bee-eaters are a colourful addition to the birding population. Apart from the Blue-cheeked and White-fronted Bee-eaters, look out for the Southern Carmine Bee-eater’s nests in the riverbanks. 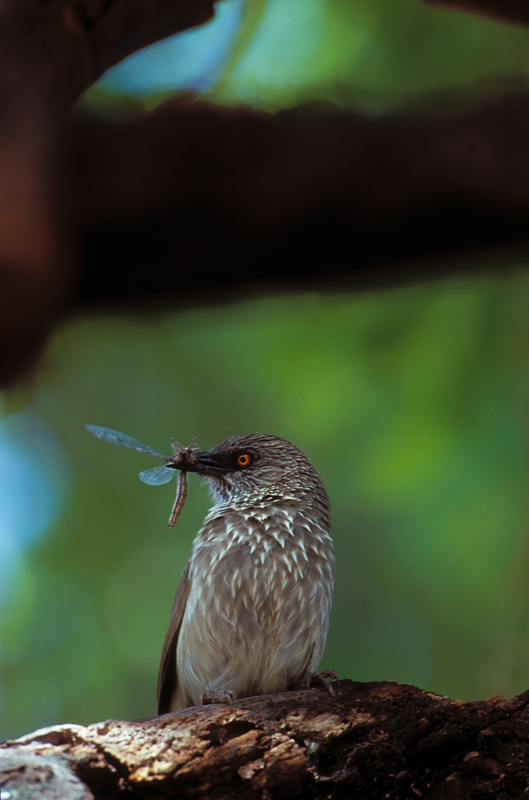 The Little Bee-eaters are a feature throughout the year. This is probably the most beautifully groomed little bird in the park. When driving along the river past the Horseshoe Bend, look out for the large Ficus thonningii forest on your right where Green Pigeons have a ball enjoying the forbidden fruit. Legend has it that when Green Pigeons get a fright, they have a tendency to drop dead, so please be quiet when approaching these trees! P J Schoeman, a well-known naturalist, once wrote, “What will be left when all our searching has come to an end? What will attract us to the next bush?” Well for me, after several enjoyable visits, the Racket-tailed and Broad-billed Roller, Narina Trogon, Bradfield’s Hornbill, Black Coucal and several other birds still remain to be seen. Apparently the road to the wildlife office is a prime area for some of these specials, but I must confess that we’re usually in such a hurry to get into the ‘real park’ that we’ve missed out on these species. As for Johan Sebastian, enjoy your bird-watching from up there. Maybe you were right about the music, but I think you’ve got the musicians all wrong. This article was first published in the Flamingo November 2006 issue.